You would not wish to put your firm in jeopardy by trusting generic software to handle your employment-based immigration matters. 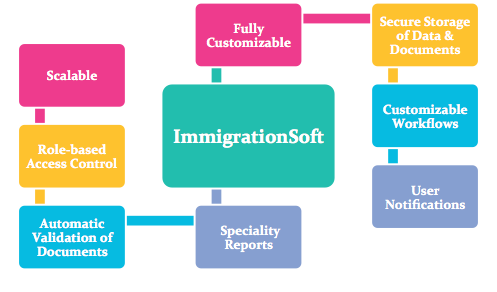 ImmigrationSoft is the only software solution designed to configure specifically to how you handle your unique employment based immigration matters from the initial interview to completed forms; so that nothing stalls or falls through the cracks. It is a web-based solution for HR departments, engineered to support the various clerical procedures and processes required by the immigration department or other administrative departments in the organizations across Qatar and the GCC. The solution assists HR departments and personnel through supporting the entire process of issuing visas, exit permits, resident permits, health cards, driving licenses as well as sponsorship transfer procedures. The Intake forms capture the specific information you need for each subject including contact information, current immigration status and more.